Not sure what’s wrong with your arrangement…except that it looks a bit “off”? Puzzled by exactly how to position your new chandelier? Experimenting is half the fun for discovering what looks best, but here are a few guidelines to help take some of the guesswork out of some common decorating dilemmas. Block – Similarly shaped and sized pictures often look most effective in a simple block arrangement. Keep the gaps between the pictures even. Framework – Set your pictures within a well-defined shape, such as a rectangle or oval. 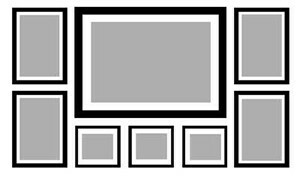 Row – For a horizontal row, range the top or bottom edge of your frames along an imaginary line. For horizontal, vertical or slanted rows, such as stairwells, display them with the centers on an imaginary straight line. Test an arrangement by laying everything out on the floor. Cutting out sheets of newspaper to the size of your frames is even better because you can work with them easily on the ground, then tape them up on the wall to help you put nails in the right place. If the lamp base is round, then round shades usually look best. Square or angular bases go well with square shades. Dining rooms – The aim is to position the chandelier low enough to create a focal point and provide light without interfering with the sight lines of people at the table. 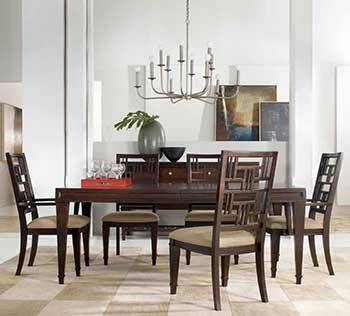 Living rooms and bedrooms – For a quick estimate on what size chandelier you need, add the dimensions of the room. If the room is 12 feet by 14 feet, add those to get 26. The minimum diameter for your chandelier should be 26 inches. Add up to 6 inches if you have very high ceilings.